Have you ever watched the show on DIY Network called Renovation Realities? It's a reality show that basically just follows real-life people doing real-life renovations in their own homes. There is no professional involved, other than an occasional local plumber or electrician who is hired by the homeowners. Just cameras, watching people unwittingly removing load-bearing walls, getting zapped by live electrical wires, and renting the wrong equipment, with some humorous text thrown in. It has become one of my favorite shows. Perhaps this makes me a sadist. I like to think that it's just because it makes me feel a little more normal. b) it had "good bones"
i) we looked at, and fell in love with it in the dead of winter, after dark, and while my hormones were still playing ping-pong with each other after the birth of our first child. The pink tile bathroom was no big deal, because that was just a matter of giving it a facelift. Same with the pastoral scenic wallpaper in all four of the bedrooms. And the horrific kitchen with orange-ish knotty pine cupboards? What? Cupboards can be changed. Turns out, all those facelifts and changes take more money, time and effort than we realized. Did I mention that we bought the house almost 11 years ago? Okay, so we've done a few things. Three of the four bedrooms no longer transport you to a creek, a pasture, or a barnyard. That's a very good thing. The cool front door became even cooler with some nicer stained glass pieces, the removal of the paint on one side, and a darker stain. All of the boring beige carpet on the main floor was removed, and six years later, the hardwood underneath was refinished. We are making progress. But it is slow. Painfully, excruciatingly slow. For one thing, you kind of have to work backward. Over the last 120 years, various owners have made some "improvements". Like wallpapering a ceiling to cover up the cracking plaster. And then painting over the wallpaper. And when the wallpaper comes loose in a few sections, just tear off the loose sections and paint over that. 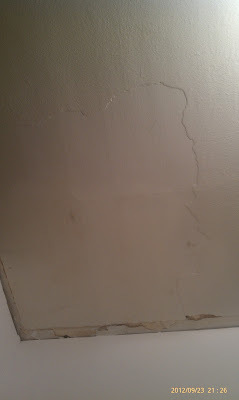 Because that looks a lot better than a crack in the plaster. *sigh* So it's not just "demo", as they say on DIY. It's demo, then fix all the things that were done wrong in the last several decades, and then you can finally start to rebuild. There may be no better example of the difficulties of renovating an old house than the project that we are currently working on. This small room was, at one time, a part of the kitchen. We never quite realized this until a few years ago. The house used to have a large kitchen, but at some point (I suppose when indoor plumbing became fashionable), nearly half of it was separated by a wall and split between a bathroom and the entryway. A couple of years ago, we removed the door that separated the kitchen and the entryway, and removed the cupboards that lined one side of the entryway. They were covered in lead-based paint, and not terribly well-built or practical, so I was happy to be rid of them. Turns out, though, that having a place to put my dishes was underrated. I would love to get the everyday dishes off of the open, warehouse-type shelving in the pantry. And the nice dishes out of boxes. 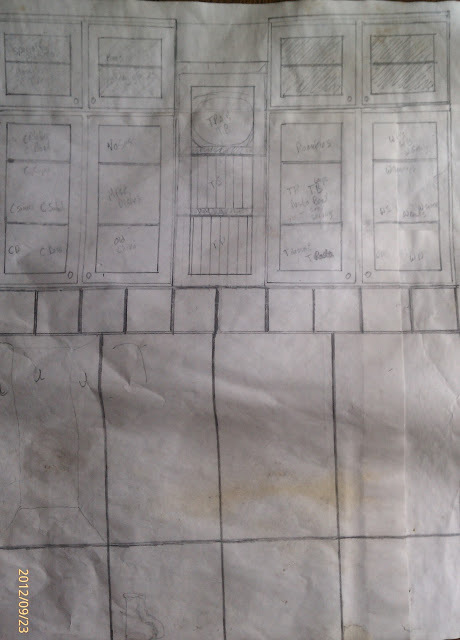 In addition, I have dreamed for about six years (ever since I saw a picture of them in the Pottery Barn catalogue), of having a mudroom with sections for each of my kids to put backpacks, coats, and most importantly, wet boots when they come in from outside. 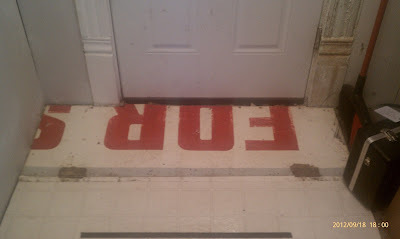 It seemed like the back entryway (where we usually enter the house) was the perfect place to take care of both problems. Obsessive? Me? Did I mention.....11 years? For cupboards, cubbies, lockers, a bench, and boot storage. Of course, a wall was in the way. No problem, right? Just take out the wall! 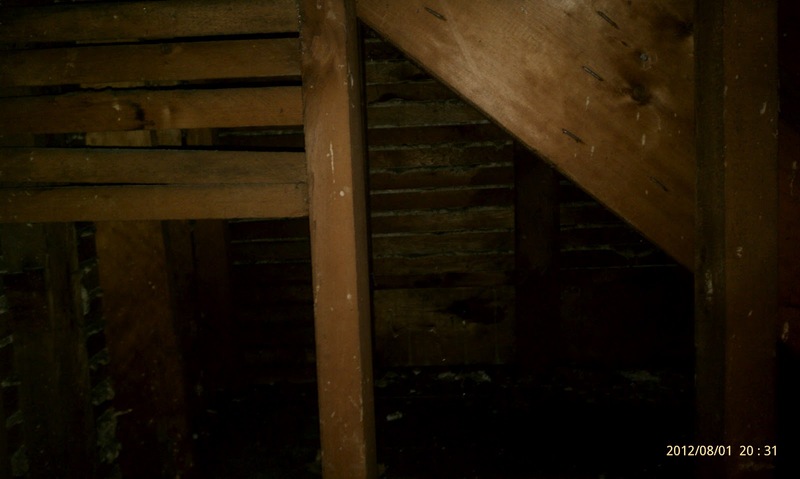 It wasn't original, so there was no real worry about it being load-bearing, and it would give us an extra foot or so to work with. An extra foot of floor to ceiling storage space is worth its weight in gold. Well, space doesn't really weigh anything....but you get the idea. So we went to work getting that little section of wall torn down. Of course, we weren't counting on the old knob and tube wiring running right through the part of the wall that is above the door. Shucks. So we had to move it. But knob and tube isn't really safe, so it would be dumb to just move it. I mean, we're in the wall already....we (and by "we" here, I mean Jeff, and you can assume that anytime that wiring is mentioned) might as well just rewire to the overhead light. 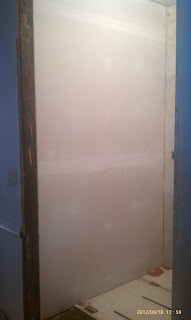 Well, that meant removing a part of the wall that we hadn't intended to remove, on the other side of the door. And of course, that led to more wiring that we couldn't, in good conscience, drywall over. So another wall came down. I wasn't sorry to see these walls go. They were part of the addition, and built with cheap wallboard, not plaster. Still, it was more work. And more time. In the meantime, we did buy the MDF needed to build the cupboards. Jeff took a week off from work, and we had a little stay-cation. The first day, we made a lot of progress. All the pieces of the cupboards were cut out. There was a lot of measuring twice, and thrice, because we have never built anything like this, so we wanted to be REALLY sure. The next morning, Jeff rolled primer on the pieces, and that is when the project hit a major snag. We didn't like the way that the paint looked. It was rough and marbley from the roller. We wanted it smooth. That took a while to figure out but we finally came to the conclusion that a foam roller is giving us a good result. In the meantime, we tore out the linoleum and most of the sub-floor, which was made of a repurposed wood "Home for Sale" sign. Again though, we hit a roadblock. The only access to our basement is through a trap door in the floor of this entryway. It was all rigged up with a pulley system, counter-weighted in the basement with old bleach jugs filled with sand. Really, who says recycling is some new idea? Anyway, the hinges were rusted, and it was hard to get the screws out. We needed to remove the hinges in order to get the For Sale subfloor out. 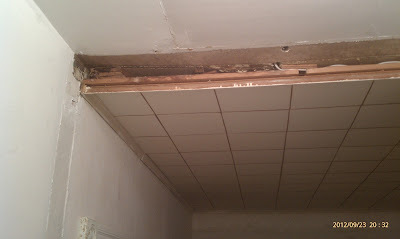 On top of that, I decided to start stripping the paint off of the wood trim that would be adjacent to the new cupboards. I had decided a long time ago to restore all the wood trim to its original beauty, but I wasn't planning on starting in the back entryway. 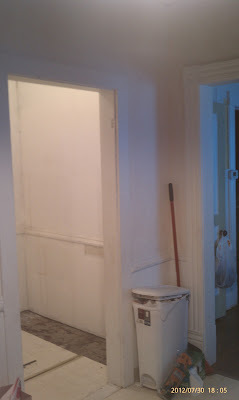 However, stripping paint is a very messy affair, and I figured I should get that out of the way before I put newly painted cupboards in, since those would inevitably get messed up by the paint stripper. So the entryway sat, stalled for a few weeks. It didn't help that there was a short camping trip for the family, a hiking trip for Jeff and Jacob, the start of school for all three of my kids, and work to go back to. Well, we've finally started inching along again. Jeff has put the drywall up, so there are no more exposed studs! He also mudded and taped it, and today, he primed the walls. I have put two coats of paint on the cupboard pieces. Some pieces need paint on both sides, so once the other side is done, we will be ready to put the cupboards together. Then we will start all over again, cutting out, painting, and building the lockers and cubbies. We also need to figure out what to do with the ceiling before we hang the cupboards. The kitchen has a dropped ceiling, whereas the entryway does not. Now that the two rooms are no longer separated, and since the cupboards will be hung where the kitchen ceiling tiles now are, we need to come up with a short-term solution. In the meantime, I can work on wallpapering and trimming out the opposite wall, as well as the wall around the door to the porch. I also really need to finish stripping the door casings. all in only five weeks. I'm feeling okay about it, though. Maybe that's because I've been watching too many episodes of Renovation Realities. Wow, Katy! You guys have done a LOT of work! It was exhausting to read! How did you guys learn to do all of this? Neither Nathan nor I have the know how to renovate (makes me glad we rent) but at the same time, I can imagine the deep sense of satisfaction you must have when a project is finished. It's YOURS! I can't wait to see it in a few years!! Julie, we haven't yet learned how to do any of this. We are totally flying by the seats of our pants! I guess, if anything, I learn by watching DIY, just like I learned to cook by watching Food Network. But watching only takes you so far. It gives you ideas. In order to actually learn, I have to just do it. Even with electrical work, I watched Jeff change several light fixtures, but I didn't really get it until I changed one myself (the one and only electrical job I have done). I plan to post from time to time, as we make progress. I just had a lot to catch up on, since we've been working on this longer than I've been blogging. And I can't wait for you to see it, either, because it means you'll be here! I thought my house was a challenge. I think you have me beat! Wait....isn't this a cooking blog?